There are some days when I just crave a big salad. I know I am not alone, and there is that famous Seinfeld episode to prove it. You don’t need a ton of ingredients to make a great salad. For example: Fill up a bowl with crunchy greens. Add whatever vegetables are fresh and happen to be in your fridge. 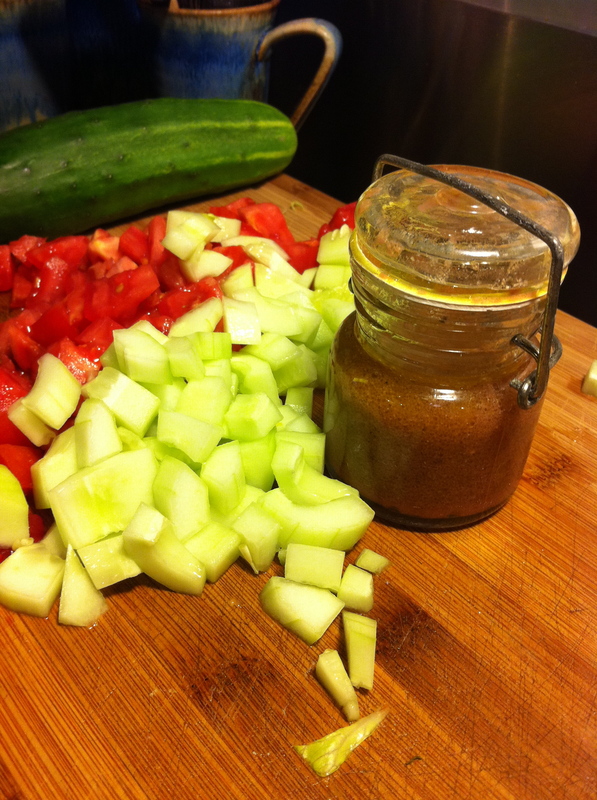 Today I did not have much–just cucumbers, tomatoes and red onions. Sounds boring, huh? But a good vinaigrette is like a fairy godmother to a ho-hum salad. The vinegar/oil emulsion magically swoops in at the Cinderella salad’s saddest moment, and dresses up a plain old bowl of greens so that it is fit for royalty. Whisk vinegar, salt and herbs until salt dissolves. Whisk mustard. Slowly drizzle in olive oil and whisk constantly until dissolved. Add salt and pepper to taste. So glad you enjoy it, Nancy! It’s been fun to do on this end, too. Hope you’re doing well!